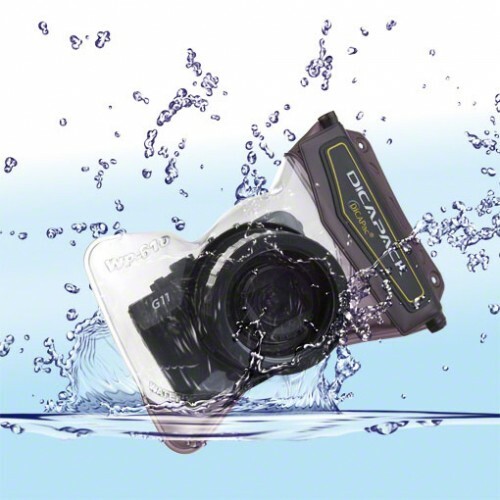 Product information "DiCaPac WP-610 Outdoor/Underwater Case"
Realize unrivalled pictures during your diving holidays, unmistakable good photographies on your rafting tour or unforgettable moments when playing in the padding pool. Take your camera for jogging or walking in rain! And you do not have to fear the next desert safari and city trip anymore! No matter where, no matter when, with the DiCAPac WP-610 Outdoor/ Underwater Case you don´t need to be afraid of rain, splash water, sand and dust., because your camera is optimal protected in the PVC case against these outer influences. The operating function is not influenced at all, because the integrated lens support ensures zooming inside the bag. Even on your snorkeling or diving tour, the DiCaPac Case guarantees water depth up to approx. 10m, so that you can approach the beautiful fishes and coral and coral algaes very near and take wonderful pictures. Very charming and convenient is the UV resistance through the material. Product information "Rain Protection Cover TELE for SLR Cameras"reliably protects your SLR with supe..